The editor/recorder that's designed to go anywhere you go, Sony's DNWA25 is small, lightweight and rugged, and includes a built-in LCD video monitor,ideal for ENG field editing. Half the weight and width of Sony's DNWA225 and DNWA220, this unit is small enough to be carried by hand and versatileenough to be used internationally. It features frame-accurate insert editing functions, as well as Betacam and Betacam SP tape playback, making it a very flexible product for broadcast stations bridging the analog and digital worlds. 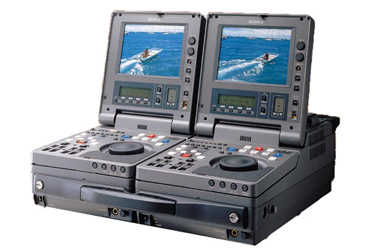 The DNWA25 can be docked with a second DNWA25 to form a complete portable editing package and can also be used as a feeder or as a third VTR for A/B roll with the DNWA220 or DNWA225. * Fast, simple, familiar linear editing in the Betacam SX format. * Compatibility with existing analog media eases the migration process to digital. * Ideal for international operations; supports Betacam SX operation in both 525 and 625 formats, as well as supporting 625 viewing of analog Betacam media. * -1/+1 playback range with Dynamic Motion Control. * Adds new efficiency to editing by recognizing shot information entered during the acquisition process. * Bright, wide-angle display makes viewing easy, even in bright light. * By using the BKNW-225 docking kit, two DNWA-25 units can be combined to provide a complete portable editing solution with complete redundancy. * Size (W x H x D): 8 3/8" x 5 3/8" x 16 1/4"